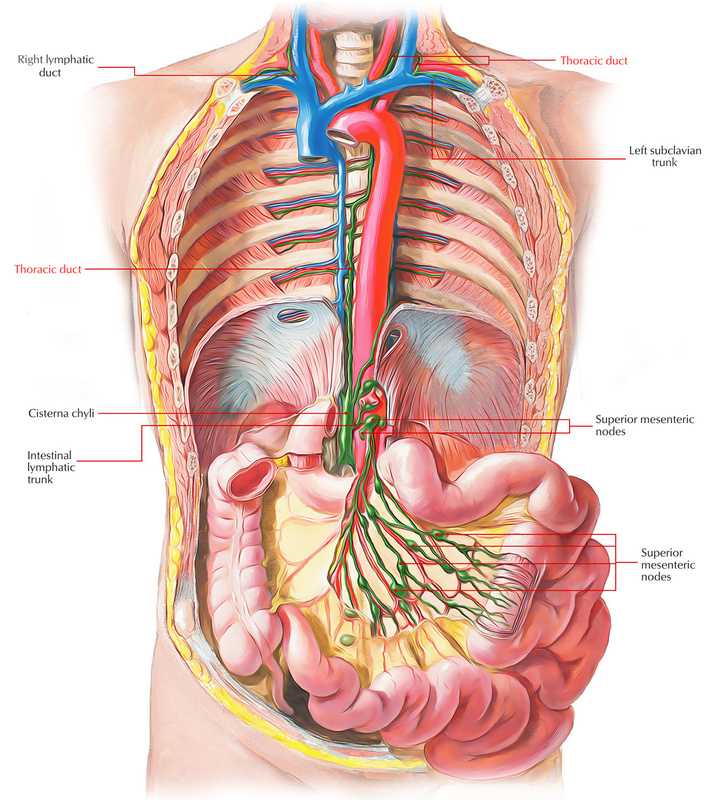 The Thoracic Duct is the largest lymphatic vessel(trunk) or great lymph channel, which drains lymph into the bloodstream from the majority of the body. Appearance of the lymph in thoracic duct is milky white since it includes a product of fat digestion (chyle) from the intestine. Because of presence of numerous valves in its lumen, the duct appears beaded. The thoracic duct drains the lymph from all the parts of the body with the exception of the (a) right side of the head and neck, (b) right side of the chest wall, (c) right lung, (d) right side of the heart, and (e) right surface of the liver. 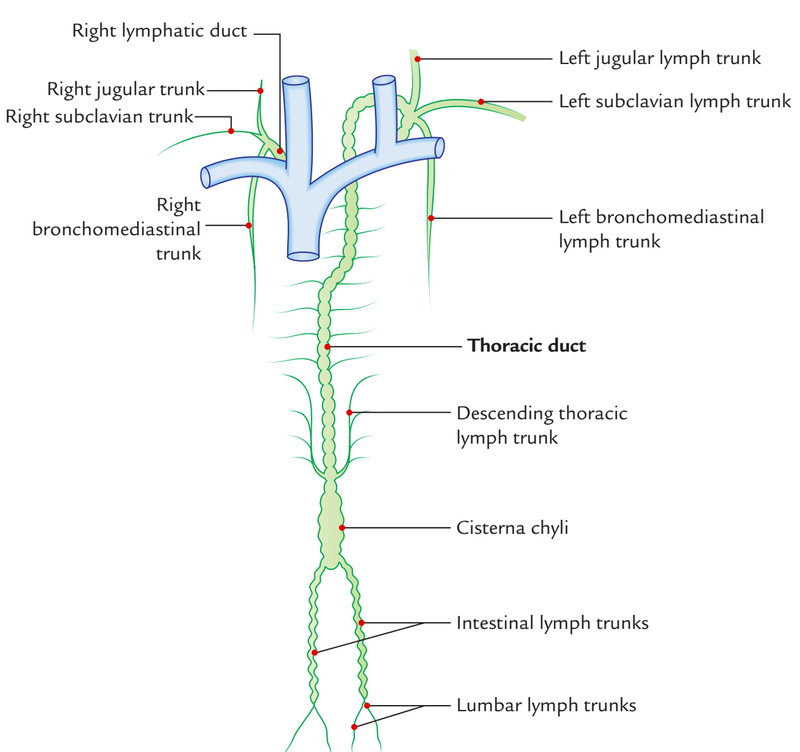 Thoracic duct drains lymph from whole of the body with the exception of the right upper quadrant of the body that is drained by the right lymphatic duct. 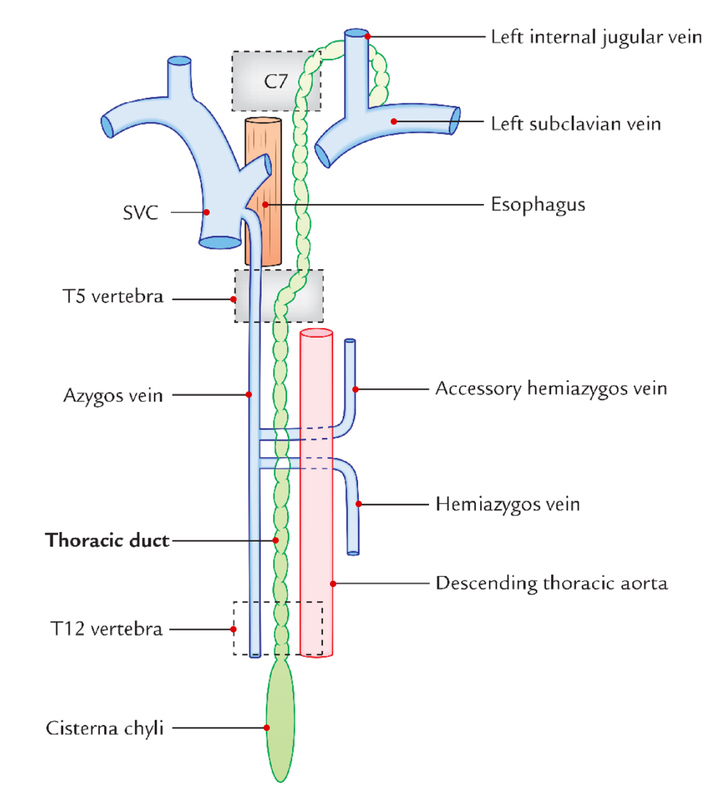 The thoracic duct extends to the upper end of Cisterna chyli on the posterior abdominal wall at the lower border of T12 vertebra to the junction of left internal jugular and left subclavian veins at the root of the neck. Length: 45 cm (18 inches). Width of lumen: 5 mm (at the ends but narrow in the middle). The duct begins in the abdomen at the lower border of T12 vertebra, as a continuation of cisterna chyli (being located in front of the bodies of L1 and L2 vertebrae) and enters the thorax via the aortic opening of the diaphragm. It then ascends in the posterior mediastinum to the right of midline on the front of vertebral bodies. On reaching the T5 vertebra, it crosses the midline from right to left side and enters the superior mediastinum to run along the left border of the esophagus and reaches the root of the neck. At the root of neck it arches laterally at the level of C7 vertebra in front of vertebral system (example, vertebral artery and vertebral vein) and left cervical sympathetic trunk and behind the carotid system (example, left common carotid artery, left internal jugular vein, and left vagus nerve). The summit of arch is located 3-4 cm above the clavicle. Finally, the duct descends in front of the first part of left subclavian artery and finally ends by opening into the junction of left subclavian and left internal jugular veins. The thoracic duct begins in abdomen, courses via thorax and ends in the neck. Anterior: Median arcuate ligament of diaphragm. To the right: Azygos vein. Terminal parts of hemiazygos and hemiazygos veins. To the left: Descending thoracic aorta. Commencement of left subclavian artery. To the right: Edge of esophagus. To the left: lung and pleura. Anterior: Carotid sheath consisting of left common carotid artery, left internal jugular vein, and left vagus nerve. Scalenus anterior muscle (medial border). Thyrocervical trunk and its branches (example: suprascapular, transverse cervical, and inferior thyroid arteries). Efferent from lower 6 intercostal lymph nodes of both sides. A pair of the ascending lymph trunks which drains lymph from the upper lumbar lymph nodes (para-aortic lymph nodes). A pair of the descending lymph trunks which drain lymph from the posterior intercostal lymph nodes of upper 6 spaces. Lymph vessels from the posterior mediastinal lymph nodes. Left jugular lymph trunk, draining lymph from the neck. Left subclavian lymph trunk, draining lymph from the left upper limb. There are 3 stages in the development of the thoracic duct. Stage I: In this phase, network of lymph channels is observed in front of the thoracic part of the vertebral column. Stage II: In this phase, 2 longitudinal lymph channels appear, in the network of lymph channels, 1 on the left and another on the right using a number of cross communications. Stage III: In this phase, the cross communication appears opposite the T5 vertebra, right longitudinal channel below this cross communication and left longitudinal channel above this cross communication persists and create the thoracic duct. All the other parts disappear. The thoracic duct is thin walled and might be colorless, for that reason, it’s sometimes injured inadvertently during surgical procedures in the posterior mediastinum. Laceration of the thoracic duct during lung surgery results in chyle entering into the pleural cavity producing a clinical condition named chylothorax. The cervical part of thoracic duct could be damaged during block dissection of the neck. It ought to be ligated immediately. If ligated, the lymph returns by anastomotic channels. However, if the injury isn’t found in the time of operation, and for this reason not ligated, it might cause an unpleasant chylus fistula and leakage of lymph. Immediate ligation of duct is required to stop the leakage. Sometimes in filarial infection, the thoracic duct is obstructed by microfilarial parasites (Wuchereriabancrofti) leading to widespread effects, like chylothorax, chyloperitoneum, chyluria, and yet the accumulation of chyle in the tunica vaginalis (chylocele).